Zorro is back! Los Angeles is invaded by an army of demonic horsemen and Zorro is the only man who can save his home from becoming Hell on Earth. 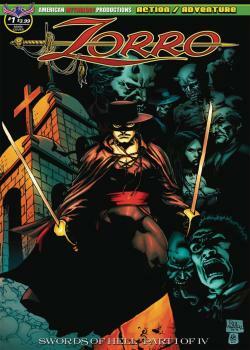 David Avallone (Bettie Page, Twilight Zone: The Shadow) and Roy Allen Martinez (House of M, Immortal Iron Fist) are proud to present the return of Zorro, as he faces down the Swords of Hell in this all new action-packed swashbuckling horror series.